Marketing exam is coming soon. Before that, still have one event to go. That is MMU social night, Semblance. Wake up in the morning and gather at MMU to go to set our hair. Team Hair help us to set the hair. See my eyes, you will know I am not enough sleep the night before. The back part of my hair, purple color. Various type of salad. I guess they tastes good. Here comes the programme of that night. Dance session. Only waltz, no cha cha? The dance floor are getting crowded, mission accomplished. Is time for us to get out from the dance floor lo. The night end at 12 something, after the participants left the ball room. Our time has come! It is committee photo session! Just 1 week after PC Fair, I went to KL again. This time is to help Ming Ping to choose the 'organ' and parts to assemble my 3rd 'son'. Ok, just skip the part we buying those stuff in Low Yat. My mission for this time is go for the Yaki Yaki Japanese Buffet restaurant for a try. The result is, MISSION ACCOMPLISHED! Argentina Squid, satisfied with the size. Almost all desserts in those Japanese buffet restaurant are nice. We kept trying those jelly. Tissue pack I think, took this as my "souvenir"
Tempura prawn. I din't see crab tempura like mention in other blogs. -.-"
The stove. Hot until my face getting red. Cutted fruits, nothing special here. Hehe. 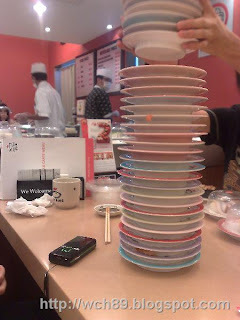 Sushi King members day come again. As a sushi lover, of course we didn't miss out the chance for this promotion. We went for 2 days during the 4 days promotion. This is how less we ate. Ordered 2 new dishes in the menu, one of them costs me 11 bucks. I have to order from the venue to fill my stomach as there are not many variety sushi for choice. Wohoo! Tempura sushi, ate 2 plates. Tempura sushi also, look nice and taste nice, first time I eat. There are also Unagi, Kurage, tako sushi which is not in the pictures. Below is the results of that day. Plate still keep 'growing up'. 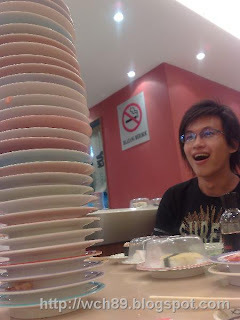 My K850 already 'pengsan' at there when he saw the plates so high. Walao! The total plates are almost 3.5 times than the first day.